Real talk: Sometimes the streets in Russia try to eat cars. It happens. This video comes to us from Tyumen, a city just east (1,600 miles) of Moscow. 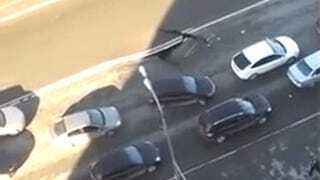 It shows a car narrowly escaping a street collapse in the middle of traffic. Around 1:15 into the video, you can see the cracks in the road getting bigger and bigger, and a few seconds later a portion of it collapses into the earth. Clearly realizing something was wrong, the driver pulls away after that, moments before the hole becomes even bigger. It's crazy how close it got to disaster. Alas, the car emerges victorious in this sticky situation, forcing the street to go hungry yet again. Better luck next time, Russia!